Story: Ideally I should have posted this recipe with the recipe for Kairichi Daal. It is difficult to write about one without the other. 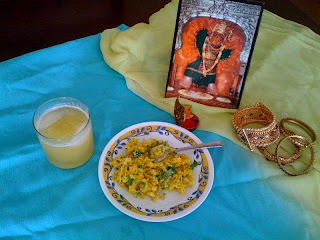 But time was not on my side.. and so after a long break here is the recipe for Kairicha Panha - A refreshing summer drink. Cook raw mango in a pressure cooker. Remove the skin and separate the pulp from the seed. Mash this pulp into a smooth paste. Add the rest of the ingredients to the paste and mix well. Store this concentrate in an air tight jar. Will last for 2-3 months. To serve the drink add 2 tbsp of the concentrate to a glass. Add water and mix well. Adjust the amount of concentrate as per taste. Goes best with .. you guessed right - Kairichi Daal.